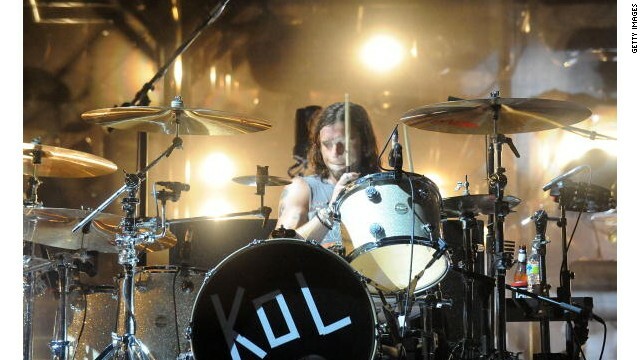 Kings of Leon drummer Nathan Followill suffered broken ribs when the band's tour bus stopped suddenly Saturday night. Jared Followill tweets: "This was the most fun tour in a while. We'll be back ASAP"
(CNN) -- Kings of Leon drummer Nathan Followill suffered broken ribs when the group's tour bus stopped suddenly to avoid a pedestrian Saturday night, the band said Sunday. The rock group's Sunday night show in Saratoga Springs, New York, is postponed, according to the announcement posted on Facebook. "The band was en route to their hotel after their show in Boston when a pedestrian jumped in front of their tour bus, causing the bus to stop short, injuring Nathan Followill," the statement said. "Nathan is being treated for broken ribs, but is doing well." Bass guitarist Jared Followill, Nathan's brother, tweeted about the mishap Sunday morning: "So sad this a.m.. Bus accident last night. Nathan has broken ribs. This was the most fun tour in a while. We'll be back ASAP. #GetWellNate"
Nathan Followill was in a good mood just before the accident, tweeting after the Boston show: "Boston, best crowd of the tour. Gonna be tough to beat. Thanks for the love. Can't wait to come back." Boston, best crowd of the tour. Gonna be tough to beat. Thanks for the love. Can't wait to come back. Fans were told to check the band's website for updates on future shows. Kings of Leon has 30 shows scheduled over the next two months, including another dozen in August as part of a U.S. tour. This is not the first time an injury to Nathan Followill forced a cancellation for the band. The group called off a tour of Australia and New Zealand in 2011 while the drummer recovered from surgery for a torn right labrum and bicep. CNN first learned of the band's accident through a Twitter posting.